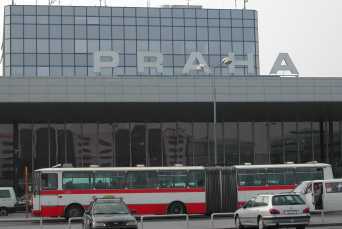 Robin and Steve arrived in Praha a day before Hugh and Becky. Hugh had a two week leave from his assignment in Saudi Arabia; he went to Houston for his birthday celebration and then flew with Becky for our rendezvous at the Prague airport. The Abelmans had things pretty well scoped out. 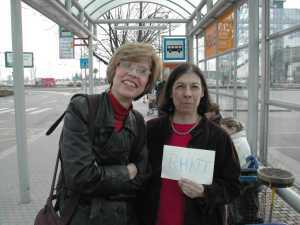 They hit the airport (direct flight from JFK to Praha), picked up the all important Czech 'crowns', a metro pass and map. Then out to the bus and off to Misha's apartment. 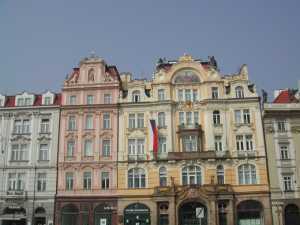 Misha (Robin's connection via Columbia University) owns an apartment in the outskirts of Prague. It was easily accessible from the airport (one bus and a 5 minute walk). The building was probably 1950-60's era Communist bloc style; nothing distinguished it from many others surrounding it. But the price was right; the subway was there as well as a decent grocery store. The apartment was two levels; you entered into a hall with two bedrooms, bathroom and then went upstairs to the large living/dining room, half bath, small kitchen and a balcony. Misha's parents left us fresh fruit and some baked goods, a nice touch. Robin & Steve went out to the local grocery and stocked up on basics (beer, snacks etc). Prices were cheap. Next they headed to the subway and into Praha itself. The subway was efficient, easy to use and never so crowded that we didn't get a seat. Payment was an 'honor' system. They assumed you paid and had a ticket. Inspectors randomly asked for your ticket and you'd best have it or there was an instant fine. We were asked once in the week we were there. Once in the main area, we headed to the large pedestrian mall, Na Prikope. It was a typical European city, places to sit, a mix of shops, casinos, restaurants (reflecting the US influence among others). We saw many tourist groups and decided that Italy and Germany must be on 'spring' break. We also found a 'net café. Robin & Steve wandered around seeing the Municipal House, Smetna Hall, Wencelas Square and the National Museum. They eventually stopped for some pizza and the first of many (!) excellent Czech beers. A word on the beer - it appeared that some of the restaurants 'featured' one 'brand'. For dinner the first night Robin & Steve found a place featuring 'budvar' the precursor to Budweiser but there was no COMPARISON. Beer was usually 'on tap' and extremely cheap- half a liter for under $1. That first day Robin also found a Bata shoe store and purchased a pair of shoes; great way to start the trip. They headed back to the apt; freshened up and came back to downtown for dinner before crashing. Becky & Hugh would arrive the next day for the official RHATT start. The next day Robin & Steve explored the Jewish Quarter (along with hordes of tour groups). The Old Jewish Cemetery was especially interesting as people were buried vertically because of the lack of space. They found a nice pastry shop, managed to get Steve a pair of Bata shoes before heading back to the apt. Then out to the airport to meet Becky & Hugh. They arrived and RHATT was on its way. Back at the apt, the first happy hour ensued followed by yet another visit to the grocery store. Then into the city for dinner at a local pub. This one featured "budvar". We had a typical Czech meal and the total for all 4 of us (with 2 beers each) was $26!! We were gonna like it here. We finished the evening with chocolate and single malt. 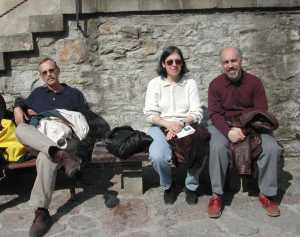 The next day after a leisure breakfast, we took the Metro to the Castle. The Castle towers over the city and is visible from the other side of the river. We got audio tours and proceeded. 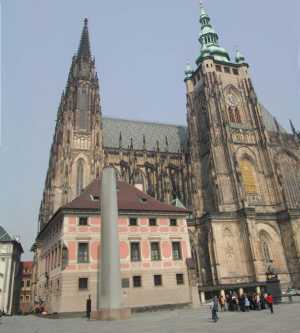 St. Vitus Cathedral was one of the main sights. It was spectacular inside and out, truly an imposing structure which was best appreciated (exterior) from further away. 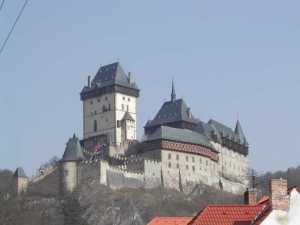 The castle consisted of galleries, museums and lots of historical significance. From the castle we walked back through the "Lesser Town" past various government buildings and visited the Church of St. Nicholas. It had a stunning gilded interior. 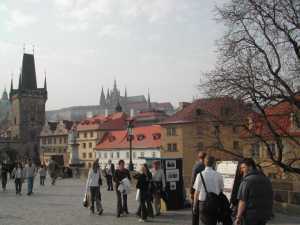 After a lunch/beer break, we continued back towards the Charles Bridge. (Stopping to get Becky some lovely garnet earrings.) Then onto the bridge which was a major Praha icon. 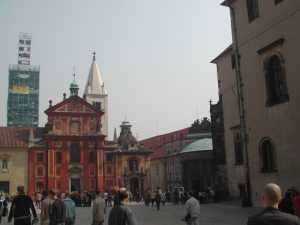 It was pedestrian only; it had statues of 30+ saints and was lined with people selling all kinds of tourist tschoskies. Lots of bad art, lots of silly things but overall a lot of fun. Weather was great-hazy in the morning but by afternoon sunny and pleasant; we walked around with coats open. The view looking back was of the castle; the view going forward was of the old town. We proceeded with various stops to look at glass and the Tyn Church. The latter had buildings in front of it. Becky found some lovely glass flowers and a vase that she bought. While it was wrapped, we headed for a beer/snack. Then retrieved the purchase and searched for a place for dinner. It took some meandering around but we settled somewhere and ate. A quick check at the 'net café and back to the apt. After breakfast we headed to the train station for the ride to Karlstejn Castle, about a 40 minute ride out of Praha. The train ride was through the countryside that was picturesque. It was another 30 min or so to walk up to the castle. The walk lead you through the typical tourist shops and restaurants with the castle looming a bit above you. It was not a breathtaking structure but obviously easily defendable. Our English guide did well despite having to stop and think about how to say something in English. The interiors were stark with minimal restoration and few original items. The return walk included lunch/beer and brief looks at some of the shops (wine glasses for the Reeves). The return train was traveling on a schedule known only to itself but eventually we got back. Yet another happy hour and then into downtown to find DHL (to ship glass back) and then dinner. Again great beer, good food and all for about $40. Back to the apt for chocolate/single malt. Robin picked up a nice garnet necklace for her mom. Then it was time for lunch just in the shadow of the bridge. We continued back over the Charles and hit a store we had spied earlier. Robin picked up two lovely small, footed glass bowls. (Getting to be a lot of stuff to carry home.) Yet another jewelry store beckoned and Becky got another pair of earrings and Robin got a garnet bracelet. Next we went to the Strahou Monastery and Library; it was a hike but once up, there was a nice panorama view back of the city, Castle and Charles Bridge. We did find the library and that was impressive. Next stop was the Loretto Shrine. One part is the Chapel of our Lady of Sorrows containing a statute of a lady with a beard. She represents all unhappily married women. Having been a long day, it was time for a …..beer. We found an outdoor café, got our beers and watched the hordes of people. We went back over the bridge and both Becky and Robin ended up with amber necklaces. Then we went on a bit of a wild goose chase. Frommer mentioned a pub and off we went but when we eventually found it, it was more of a disco and we really didn't like it. Hugh noticed another place so we wandered around and eventually found it. This was a huge touristy place complete with accordion and tuba player. Beer for the men came in full liter mugs; ladies got a mere half liter. Food was fine and total bill was about $35 for all of this. Amazing. We crawled back to the apt having shopped ourselves out and made a substantial contribution to the local economy. Today the RHATT officially ended as Hugh and Becky departed. Robin and Steve spent the day exploring the Museum of Prague. In walking around they noticed a wide variety of architectural styles-communist influence, cubist, gothic, a bit of everything. They had one more happy hour and a nice dinner at Klub Architectura, in a catacomb like place; good food, surly wait staff but it was only $15! Then back to pack for next day departure. Overall Prague (Praha) was a lovely trip. It was easy to get around, reasonably priced with a real old European feel to it.